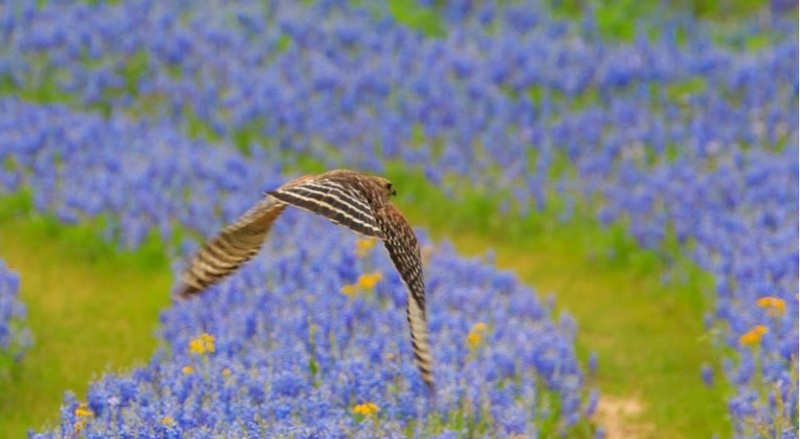 AUSTIN— Spectacular displays of blue, pink, red and yellow are blanketing the state, and Texas State Parks offer picturesque settings for family photos of this year’s parade of wildflowers away from busy roadways. Texas is home to nearly 6,000 species of plants, and recent rains are assured of accompanying a colorful wildflower explosion from spring through late fall. More than 90 Texas State Parks offer some of the best and safest places to view and photograph nature’s bounty of wildflowers, blooming shrubs, and trees. Always remember to exercise caution when taking wildflower photos on busy roadways by using your emergency lights and being mindful of disturbing wildlife resting or hiding in that location, such as nesting birds, or awkward encounters with venomous snakes and fire ants. Park visitors can share their wildflower pictures, and see what’s blooming around the state, on TPWD Instagram, Facebook and Twitter accounts. Central Texas: The rolling upland hillsides, canyons, and creek and river bottoms are providing a colorful and teeming wildflower wave that is layered with bluebonnets, Engelmann’s daisy, Texas star, blue sage, Indian blanket, Mexican hat, prairie fleabane, prairie verbena, green thread, two-leaved senna, four-nerve daisy, Drummond’s onion, green lily, old plainsman, golden eye phlox, white milkwort, wine cups, perfume balls, phlox, Missouri primrose, white heliotrope, antelope horn milkweed, sundrops, white rain lily, Drummond’s skullcap, Blackfoot daisy, foxglove and Lindheimer’s paintbrush. The Hill Country canyon woodland ground flora is draped with Texas silver puff, rock lettuce, false dayflower (‘widows tears’), plateau spiderwort, baby blue eyes, red columbine, Texas milkweed, blue curls, and round leaf groundsel. Coastal Texas prairies, barrier islands, and the South Texas ’Sand Sheet’: An wide arrange of wildflowers are on display including prairie nymph, prairie clovers, betony-leaf mistflower, Indian blanket, Silverleaf sunflower, seaside goldenrod, showy nerveray, erect dayflower, Texas groundsel, woolly whites, longbract wild indigo, coral bean, Rio Grande green thread, American snout bean, coast germander, sand rose gentian, sand verbena, phlox, sea lavender, sea oxeye, sea rocket, Gulf Coast Camphor daisy, saltmarsh mallow, beach morning glory, and side-cluster milkweed. East Texas: The Pineywoods’ hardwood slopes and bottomland forest flora has been extraordinary with a plethora of wildflowers including trout lilies, trilliums, Solomon’s seal, mayapple, partridge-berry, golden Alexanders, violets, purple meadow-rue, groundsels, Carolina vetch, wisteria, flowering dogwood, yellow jasmine, crossvine, jack-in-the-pulpits, Virginia sweetspire, hawthorns, white-flowered milkweed, azalea, fringe tree and silver bells. Wetlands are profuse with spider lily, Bluestar, spring cress, Canada garlic, and blue iris. Upland and wetland pine savannas are dominated by old plainsmen, Carolina puccoon, yellow colic-root, candy root, prairie snout bean, Queens’s delight, sundews, silky prairie clover, meadow pink, false dragonhead, downy phlox, rose vervain, spiderworts, Carolina larkspur, bull nettle, and toadflax. North Texas: The landscape is generous with Indian paintbrushes, brown-eyed Susan, winecup, American basket flower, Barbara’s buttons, American wild carrot, showy evening primrose, plantain, Texas prairie parsley, fleabane, prairie clovers, blue-eyed grass, buttercups, snake herb, butterfly weed, false dragon-head, sundrops, Beeblossum, Texas skeleton plant, larkspur, coneflowers, blue mealy sage, wild indigo and overwhelming numbers of green milkweeds. West Texas: The lower Big Bend wildflower displays are accumulating and include Big Bend bluebonnet, whole leaf Indian paintbrush, rock penstemon, several crinklemat species, rigid paintbrush, yellow rocknettle, Yerba Raton, dogweed, paperflower, shrubby skeleton-leaf goldeneye, twin-leaf senna, limoncello, several species of salvias, purple wooly locoweed, ocotillo, lechuguilla, fragrant yellow huisache, cenizo, yuccas, and many cactus species that are on display along the Rio Grande River road and at Big Bend National Park and Big Bend State Natural Area. To buy the bluebonnet or one of the other seven designs available, visit www.conservationplate.org/stateparks or your local county tax assessor-collector’s office. Buyers do not have to wait until they receive a renewal notice, they can order at any time, and the cost will be pro-rated. All conservation plates are available for cars, trucks, motorcycles, trailers, and RVs.